Chennaites are going through a punishing weather these days. I am drinking gallons of water and juice to beat the heat :) Sometimes I also include fruit salads to this list. What about a salad which is a bit spicy and crunchy? Would be an amazing combination right? I loved it completely when I prepared it for first time. Give it a try and I am sure you'll like it. 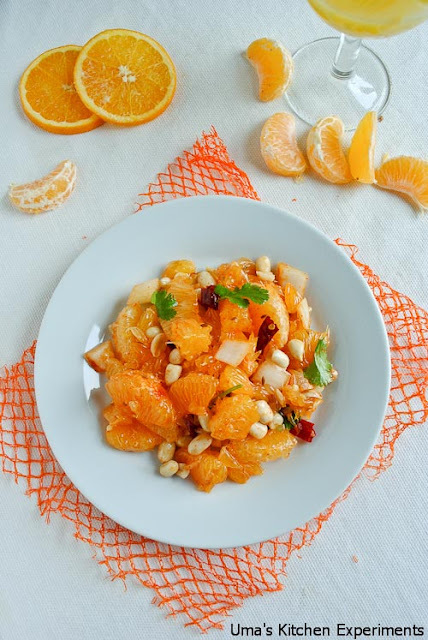 1) Mix, oranges slices, peanuts and onion in a mixing bowl or wide plate or whichever is convenient to you. 2) Add lemon juice, olive oil, cumin seeds, dry red chilli, red chilli powder and toss well. Make sure all the ingredients are mixed well. 3) Sprinkle coriander leaves and serve this dish. Uma, I love the salad recipe. 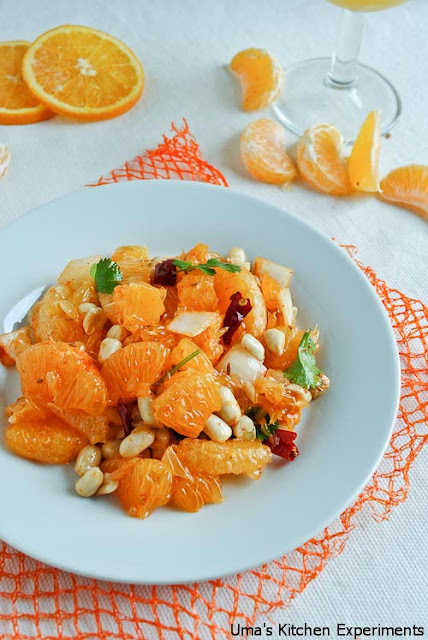 I will make it ASAP because I love oranges and I am too fond of peanuts. I love the photos that you phase posted. So orange and colorful. Thanks for sharing. Quiet healthy and delicious salad !! lovely one !! healthy and yummy salad..beautifully presented!! grogeous click n unique combo.. yumm refrsehing looking salad..
wow thats really healthy salad...love the peanut twist. 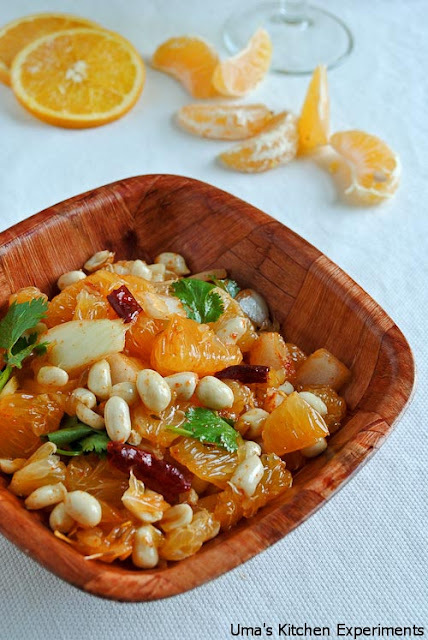 Omg, super tempting salad, simply loved the addition of peanuts..Can imagine how this salad will be delicious and nutty..
Wow Uma, love love this salad. I know what I am going with those oranges in my refrigerator tomorrow. Looks superb.